The only real 'trick' in this year's Halloween weather forecast for the Garden State will be cooler temps. Of course, following this theme of summery weather, a line of pretty intense thunderstorms pushed across the state late Sunday afternoon. Rainfall totals were solid, coming close to an inch for parts of northern and central New Jersey. As I talk about often, over 39% of the state currently sits in the "Severe Drought" category. Will the rain from Sunday and Thursday help? Maybe. The new Drought Monitor will be released on Thursday, using data through Tuesday. Behind Sunday's thunderstorms came a cold front, which has since ushered in cooler air on a brisk northerly wind overnight. That wind is expected to die down by about 10 a.m. Monday - until then, we'll have to deal with a stiff breeze and scattered clouds. 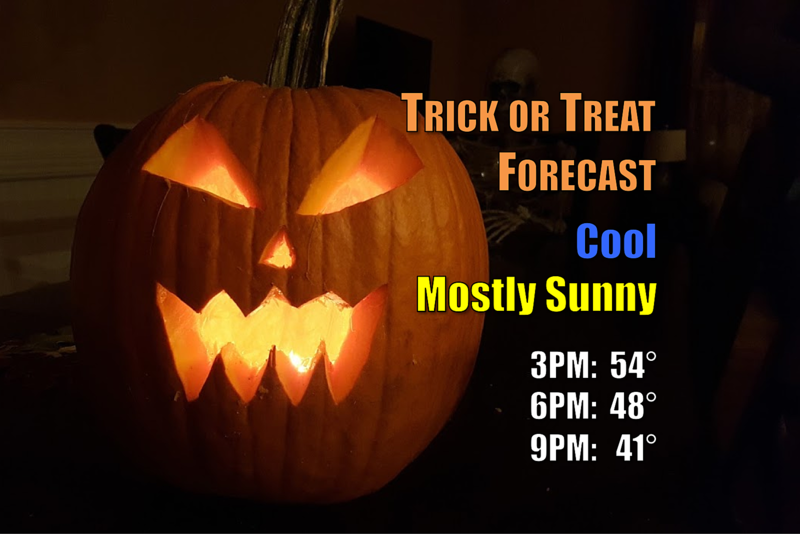 While skies will be predominantly mostly sunny on Monday, the cooler temperatures will certainly be noticeable, and may have an impact on your Halloween trick-or-treating plans. Highs on Monday afternoon will be limited to the lower to mid 50s - that's 5 to 10 degrees below normal for the last day of October, and at least 20 degrees cooler than Sunday. So a jacket or an extra layer or two under the costume may be necessary, given the chilly temperatures. Werewolves will thoroughly enjoy the forecast for Monday night, with plenty of moonshine expected. They'll be happy to have that thick fur coat too, as overnight low temperatures dip down into the 30s. As long as clouds generally stay away, a frost or freeze is likely for most of New Jersey for Tuesday morning. As we begin the month of November on Tuesday, we'll begin another warming trend. Highs on Tuesday afternoon will reach around 55 to 60 degrees, just a hair below seasonal normals. The forecast currently favors clouds over sun as Tuesday goes on, as humidity increases in the atmosphere. That increased humidity will also directly lead to milder (i.e. warmer, well-above-freezing) mornings through the rest of the week. Wednesday's high temperatures are forecast to bump to 65 to 70 degrees, again with partly to mostly cloudy skies. And the warmth will peak on Thursday, with widespread highs in the 70s. Skies will be mostly cloudy, and it will get breezy. Furthermore, as a cold front approaches New Jersey, showers and thunderstorms are expected to sweep through the state. Right now, the best timing for the rain is from Thursday afternoon to early evening. Following Thursday's cold front, we cool down again. High temperatures on Friday are forecast to fall back to the 50s. That's probably about where we'll end up for the weekend too.